A new digital national trade platform, officially launched on Wednesday, can enable cross-border trade linkages through technology. Four individuals and a team of four have been awarded this year’s President’s Science and Technology Awards (PSTA), the highest honors conferred upon research scientists and engineers in Singapore. On July 5, the government has acted to cool the red hot residential property market by introducing a fresh round of cooling measures, which included higher Additional Buyer’s Stamp Duty (ABSD) rates and tighter Loan-to-Value (LTV) limits. Singapore-based foodtech startup, Alchemy FoodTech, has secured a seven-digit investment in a pre-series A round led by Heritas Capital Management, and co-led by Seeds Capital, the investment arm of Enterprise Singapore. Almost 14 million tourists visited Singapore in 2017, helping the country retain its position as the fifth most visited global destination out of 162 cities, and the second most visited in Asia-Pacific behind Bangkok – based on the latest Mastercard Global Destination Cities Index released on Tuesday (Sept 25). A Singaporean man has lodged a report with the police after a nasty experience with a Malaysian immigration officer, who allegedly defiled his passport and asked for some hush money if he wanted to enter the country. UK based regulatory technology firm VoxSmart is helping Singapore’s leading energy and commodity firms boost revenue and manage risk by enabling employees to trade across Instant Messaging platforms like WeChat and WhatsApp. Singapore’s silver tsunami: Is HR prepared? According to reports, Singaporeans live longer than most of their peers in the region. Mandarin Orchard Singapore was named “Best City Hotel-Singapore” at the 29th Annual TTG Travel Awards 2018, marking the hotel’s sixth consecutive year to clinch the coveted title. Singapore’s healthcare system takes the lead in efficiency, boasting the most favourable ratio of spend versus health outcomes, among 16 countries globally included in our latest Future Health Index report. Ride-hailing firm Grab said on Wednesday it would stop offering car-pooling services during late-night hours in Singapore after drivers complained about some passengers being drunk and argumentative. The State Courts of Singapore have slapped an engineer of Chinese internet giant Tencent Holdings with a S$5,000 (US$3,663) fine for hacking into a hotel’s Wi-fi server during his stay in the city state last month. Although I do research on South-east Asia, everytime I am in one of the region’s major cities like Jakarta, Bangkok or Ho Chi Minh City, I am still always surprised by how fast these cities are growing. The Singapore dollar continued its ascent against the Malaysia currency on Wednesday (Sep 26) to reach a 2018 high against the ringgit. Honestbee, a Singapore-based online concierge that delivers things like groceries, food, flowers, and parcels to its customers, has its eyes fixed on regional markets. Dr Christine Cheung, who researches at the Laboratory of Molecular and Vascular Medicine at Nanyang Technological University (NTU), is the only woman honouree at this year’s Ten Outstanding Young Persons of Singapore award show organised by the Junior Chamber International Singapore. Today, Microsoft announced its collaborations with AI Singapore (AISG) to foster a greater aptitude in AI among Singapore’s workforce, and National University of Singapore (NUS) aimed at applying artificial intelligence (AI) to enhance research. As HSBC mounts an aggressive push to tap the burgeoning wealth in Asia, HSBC Singapore has targets to double total wealth – including deposits and investments – from the retail and private banking segment over the next five years. The biggest gathering of oil traders in the world’s hottest market is drawing to a close. As they leave Singapore and head back to their desks in Geneva, Houston and Shanghai, the mood is the most bullish it’s been in years. Failings in organisational processes and staff judgment were exposed by the committee probing June’s SingHealth cyber attack, as a key technology “risk man” was grilled on Wednesday (Sept 26). 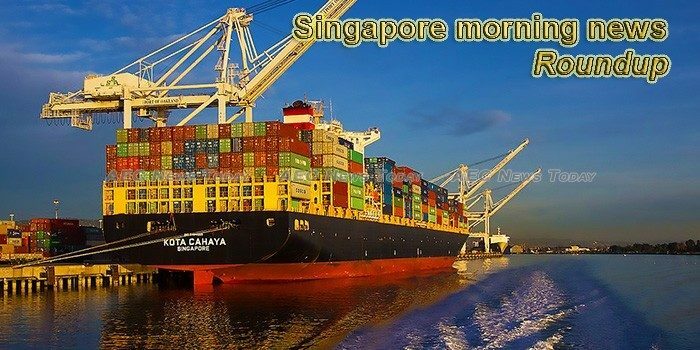 This week’s Singapore morning news feature photo acknowledges World Maritime Day September 27.